You are currently browsing the tag archive for the ‘cocktail’ tag. Now THIS was a lyric I could get behind, because from the moment I concieved of this blog, I knew how I was going to put Harrison’s words into consumable form: by making a delicious alcoholic beverage. A cocktail of mine own creation. I must be a bit of a lush since as soon as I heard the word “sling” I immediately thought of a Singapore Sling cocktail, which is some ghastly fruity concoction that only girl-drink-drunks would ever consider slurping back. Being a pretty dedicated consumer of dirty martinis, I do not particularly enjoy sugary alcoholic beverages. I like my booze to be astringent and pure, free of sugary mixers (aside from club soda) and maybe only mildly flavoured with real lemon or lime. 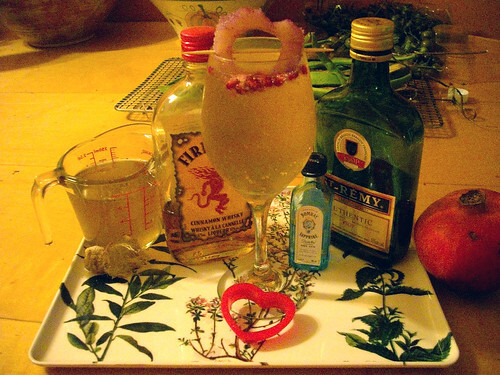 So I knew I didn’t want to just make a cloyingly-sweet version of a Singapore Sling. Instead I came up with this punchy, spicy, only slightly-sweet cocktail, that I think just about everyone can enjoy. Responsibly, of course. Shake boozes together well in a martini shaker. Strain into a glass. Add syrup and soda to the top. Garnish with pineapple heart and some pomegranate seeds if desired. *My heart-shaped cookie cutter wasn’t sharp enough to actually punch the shape out of the pineapple slice, so I just used a sharp knife to trace around the edges. If you don’t care about your pineapple actually being heart-shaped, just cut a slit in it and hang it off the edge of the glass. Combine ingredients in a saucepan and bring to a boil over high heat, stirring constantly. Reduce heat to medium and let simmer 2 minutes. Remove from heat and let cool in pan. Strain into a jar. Store in refrigerator. Yields enough for 4 Ginger Slings.